Yesterday we told you about our plans to make over our old house before we put it on the market, and today I'm back to walk you through our design process. As far as I'm concerned, the design process is the stuff dreams are made of - you get to go wild with dreams and possibility. In fact, you have an obligation to do so. While I always have to scale back (hello, budget), and redefine my dreams, I think examining the process is worthwhile. Have a look at the ideas we considered in bringing this room into all its glory. I write this next sentence every year, and every year I believe it more: if buying gifts could be my full time job, I would be the happiest person on the planet. I love everything about gift giving. The rituals, the sentiments, the experience of finding the perfect thing for the perfect person. It's a total thrill and my total Kryptonite. This holiday season, we partnered with Minted to create a set of gifts perfect for the people you love most. Your man, your woman, your boo, your bestie, your bae. They're all accounted for in this collection. So, grab your warm beverage of choice, settle in under your coziest blanket, and have a look at these gorgeous gifts. You've seen those beautiful MMC planters, but have you ever seen a lamp with a nod to that style? It looks identical to that planter, but it's a lamp! This beautiful DIY project looks easy enough to make and just oozes style & sophistication! The IKEA ÅRSTID Wall Lamp is one of those items that I would pass right by because of the lamp shade style. But the genius blogger behind Shine Your Light didn't, and what she came up with is beautifully contemporary. 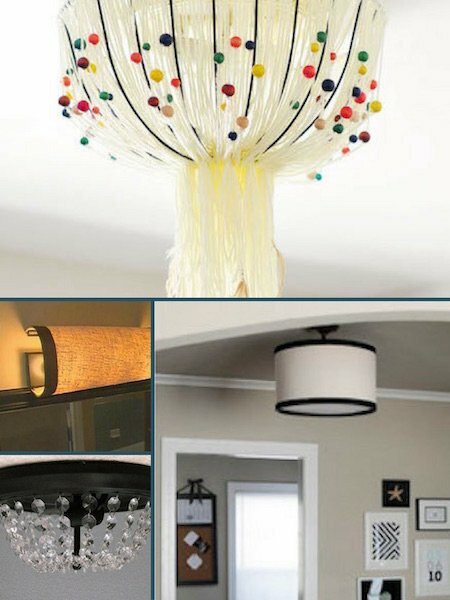 Click through to check out her incredible sconce hack. How To: Make a Glorious Woven Pendant Shade with Embroidery Floss! Leather is an underutilized material when it comes to DIY projects for the home, but it's also one of the most versatile ones... so today we're sharing some ideas to inspire you to use more of it around the house. Here are ten simple ways to incorporate leather into your home. (And if you're not into leather for ethical reasons, please note that most of these projects can be done with vegan leather too!). Have some hanging lights in your space that you just don't love? Or do they need a little update? This leather DIY version is super clean and totally easy to recreate!